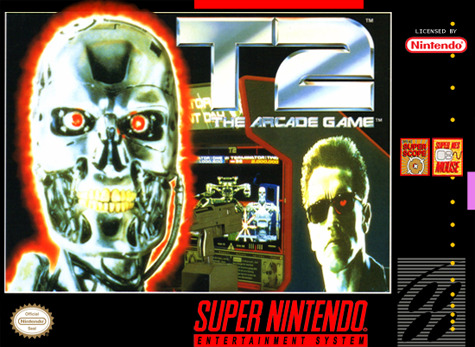 T2: The Arcade Game for Super Nintendo brings the arcade game into your home. The game has you as the T-800 Terminator, a machine saddled with the unenviable task of eliminating the liquid metal T-1000. You'll have rapid-fire machine guns, plasma pulse rifles, shot guns, M-79 grenade launchers, and guided missiles at your disposal, and you're going to need them. Loads of endoskeletons and borgs have it in for you as you seek out your nemesis. For 1-2 players.